Casa Pequeño Paraíso - beautiful luxury villa is located 1 ½ blocks from the quiet north-end beach in Sayulita Mexico. This is where the “left” surfing break is located along with the beachfront restaurant, La Terrazola. Casa Pequeño Paraíso consists of two separate houses: the Main House and the Casita. Guests at Casa Pequeño Paraíso in Sayulita will be delighted at the attention to detail of both the design/construction as well as the houses’ furniture and décor (both indoor and out.) 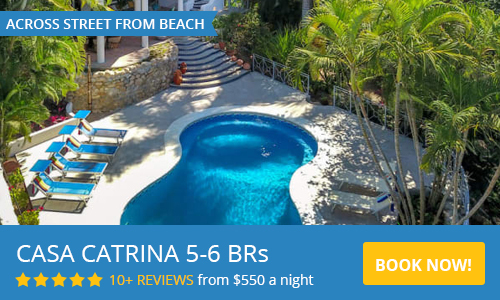 Both of the houses as well as the grounds, palapas, and pool have been created to ensure a fantastic Sayulita vacation in a safe, tranquil environment. There is an interior jungle garden with a little fountain for the full experience of the paradise living and the huge top floor Palapa, perfect for your family and friends gatherings. Please view the Pricing tab to view individual rates for the three and four bedroom options. The Main House has three bedrooms and 3,5 bathrooms, and can comfortably sleep up to 6-8 people. The living/dining room area opens up to the garden and swimming pool. Poolside palapas with hammocks as well as a rooftop palapas have also been included in the architectural design, thus ensuring fabulous locations to read, nap, sip, and converse throughout the day and evenings. Ceiling fans and A/C help keep the house cool! The master bedroom on the second floor features a private bedroom with a walk-in closet, double sink and open-air shower. This room offers you also a terrace with leather seatings and an incredible pool and mountain view. The second bedroom, located also on the second floor, has two little balconies, private bathroom with walk-in closet and double sink. There are two double size beds and its perfect for kids of close friends. The last bedroom of the house located on the main floor, features two single beds, closet, double sinks and a private full bathroom. The casita has a King size bed, bath, air conditioning and is perfect for two guests. Please note the property is rented to one group at a time, the casita is not rented independently from the main house. Guests can simply choose the 3 bedroom option, main house only, or if you need more room, the casita adds a 4th bedroom. Please use the contact form for any questions and to request a reservation. We look forward to welcoming you to Casa Pequeno Paraiso - your little paradise! Just completed our first visit to Sayulita during which we chose to stay at Pequeno-Paraiso villa. The pictures show exactly what you will find. Smartly furnished, comfortable, and secure. The pool water temperature was perfect, patio spacious and covered area a good escape from the sun, if needed. The villa is a ten minute walk to center of town, two blocks to north beach, and around the corner to some restaurants, transportation sources, small groceries, pharmacies, and other locations. We never were able to get the satellite TV to work and had a couple problems with Wi-Fi but were able to eventually get connected. The sunsets from the roof top terrace were breathtaking. Enjoyed our stay and would consider staying here again of we came for another vacation to Sayulita. The price and location were very good. Stayed here twice...There's a reason! This was our second time staying @ Pequeno-Paraiso. Love how close it is to the plaza and beach! Very clean and comfortable. What an amazing place to stay in an amazing place to visit!! We arrived after dark and the lighting of the house and pool area made us all exclaim, WOW!! The pictures don't do it justice. The entire house is lovely. Every bathroom was spacious with great showers. The kitchen is fully stocked - we cooked 3 meals in it. When we come back to Sayulita we will stay here. A few notes for people with kids: the pool is NOT heated. It was actually so cold it was unusable during our stay, which was a huge disappointment. We selected this house in large part because of the pool and how much fun we imagined our daughter would have in it. If you're going to stay here in the winter, please know that the pool will be virtually worthless to you. Also, the railings/walls on the balconies are VERY low. We made sure we kept the doors to the patios locked at all times. Otherwise, a really nice place to stay in Sayulita! Thank you for your review. We have tried to fix the heater to the pool, but because of its age cannot find parts. We do not advertise a heated pool and it is only needed December to March. We really enjoyed our stay in this villa. We have stayed on many of the villas on this corner and this is one of the nicer ones. Plenty of space, great pool, very well stocked! We will rent again. Thanks! Great location and easy walk to the town. Spacious bedrooms with a family feel. My sister got married in sayulita and we rented the main home and casita for a week. It is gorgeous... Of all the houses we saw in sayulita because of the friends and family there for the wedding, we think pequeno paraiso is the nicest one! The foliage around the home is incredible - they've done a great job. We hung out under the palapa, had breakfast and coffee on the beautiful rooftop, and enjoyed retreating to our own suites for relaxation and quiet time. Its a beautiful home. It's a short walk to the more quiet, relaxing beach and there is tons beach gear to use! Our only bummer is that the pool is not heated, was really cold - too cold to comfortably swim in, especially with little kids. We were told the heater was broken and there would be a daily charge to heat the pool IF it could get fixed. This something I wish we had known beforehand when researching rentals in sayulita. Most beautiful vacation home we've stayed in. This home is absolutely magnificent. The location is great, close to town and the beach, yet nice and quiet. The home itself is stocked with everything you would need. We can't say enough good things about this house! We will be back. This house'e title is very accurate but the photographs do not do her justice!!!! Pequeno Paraiso was a fantastic place. The location was perfect, was literally 1 1/2 blocks to the beach, and just a short stroll to the markets, restuarants and night life. But far enough away that it was quiet. We rented both the Casita and the main house. We were 2 families with 9 people all together and had more than enough room. Everything was provided, right down to the backpack beach chairs, Umbrella and roller cooler for the beach. The palapa was perfect for shade from the mid day sun, and the pool was great and perfect for our kids who were 8-11 years old. Every room had their own bathroom, and air conditioning. Each bedroom suite had their own deck and a beautiful roof top deck with a veiw looking over Sayulita. We will most definitely be staying here again. Hi, I am Alfonso. I am 35 years old, from the north of the State of Nayarit, cheerful, fond of the drama and suspense film, "Marvel" fan. Nature and the beach are one of the wonders that I enjoy when I rest with my family.